Aoyama Flower Market is a popular florist chain with locations across Japan and in Paris, France. The Aoyama Flower Market Tea House offers a unique dining experience at three florist branches in Tokyo: Aoyama, Kichijoji, and Akasaka. 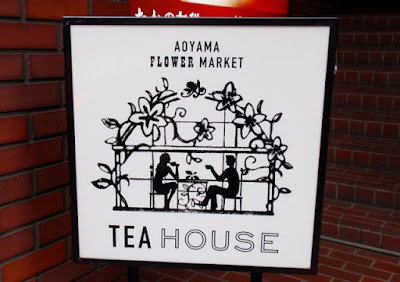 The Teahouse in Aoyama is located down a short flight of stairs just steps from Aoyama-dori on Omotesando-dori. 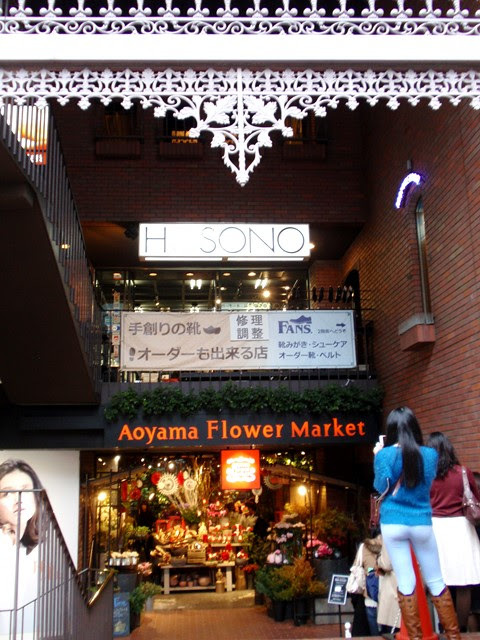 This is a popular destination, so a long wait in a queue is not unusual. 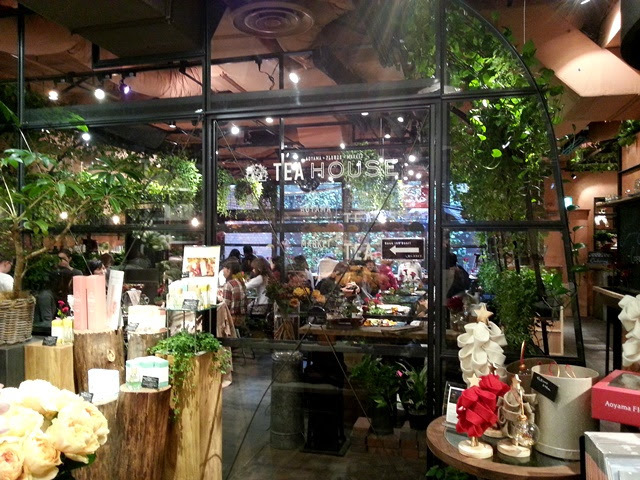 After a relatively brief 30 minute wait, I was guided to the Tea House located at the back of the florist shop. Seating is at tables and at a bar with a view of a small courtyard garden. The room is filled with life and color from the flowers and plants filling the space. 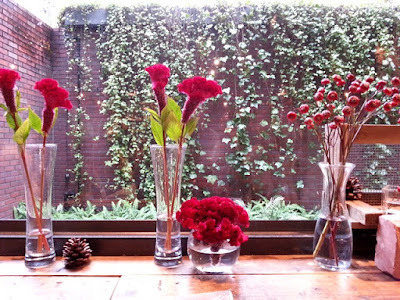 Here you can truly feel the AFM concept of "Living with flowers everyday." 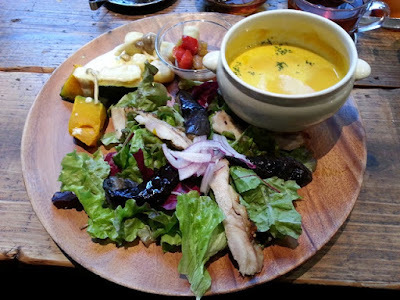 The Tea House offers a seasonal menu alongside their regular menu and I selected the Autumn set which featured a hot potato potage, salad with chicken, and marinated pumpkin (kabocha). Everything tasted deliciously fresh, rich, and savory and I was honestly sad that I wouldn't have another opportunity to eat here again during this visit. 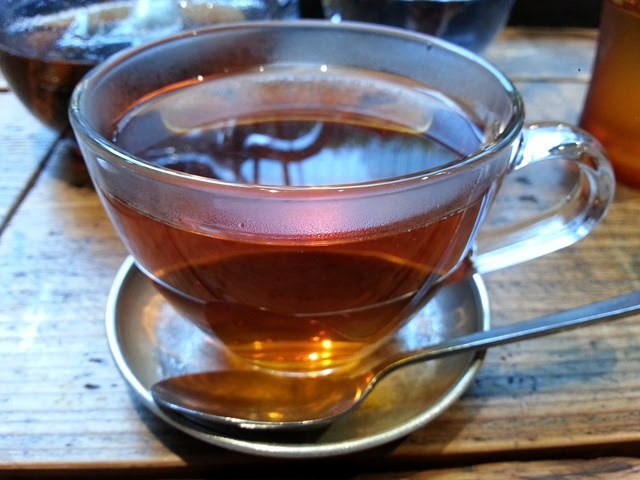 My beverage was Jardin De Colette, a fresh and delightful tisane made with pear, apple, raspberry, and common mallow flower. It was enjoyable on its own, though I found that a touch of sugar brought out the flavor of the fruits and flowers. 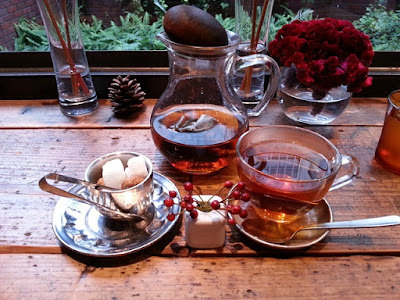 Mind the wood stopper on the teapot when pouring. It has a habit of rolling away and may provide unexpected entertainment for your neighbors.